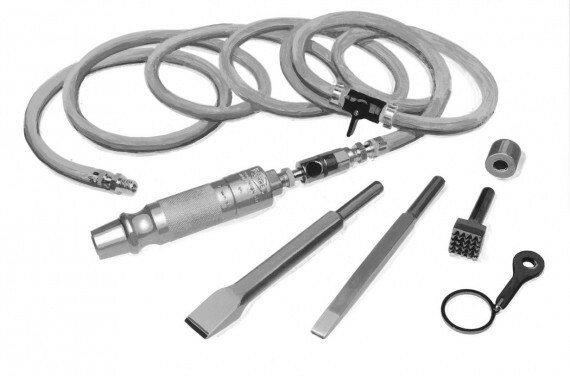 By utilizing pneumatic hammer and chisels originally designed for stone sculptors, this collection of tools offers improved control and efficiency to the maintenance or reconditioning of millstones. 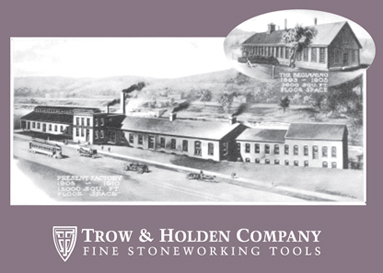 The smooth action of Trow & Holden pneumatic hammers over their full range of power, means a single hammer can be both delicate enough to refurbish fragile, historic stone, yet durable enough to handle more demanding commercial maintenance and resurfacing applications. 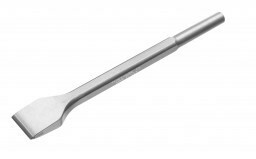 The tools included in the Millstone Dressing Set have been assembled with the guidance of professional millwrites and experienced millers. The 1in Type-B Pneumatic Hammer included in this set is a versatile air-hammer, and the largest of Trow & Holden's short-stroke pneumatic hammers. 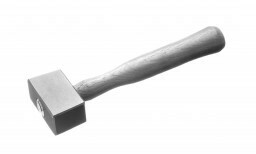 Pairing this air-hammer with one of our 1in-square Bushing Chisel makes resurfacing productive and uniform. For more delicate work, simply turn the airflow down and utilize the Machine and Clean-Up chisels to carefully reestablish furrows. The addition of a few accessories help complete the Millstone Dressing Set, offering increased versatility and convenience.